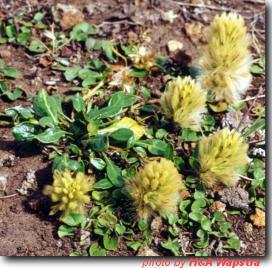 Vertical from ground, fluffy spikes 3-7cm long, covered with long straight hairs, green/yellow. Perennial herb, spreading prostrate stems. Occasional in dry grassy places. Difficult to collect seed as it ripens unevenly on each head. Variable germination, removal of fruit to pure seed may promote germination. Suitable below powerlines. Grown from seed, but low seed viability. Viable seed usually germinates easily without treatment. Fresh seed recommended.